--- i never felt their sting. when you saw their venom work. this is my computer monitor on drugs. i am trying to read a post at vandwellers, but the image is blinking like....well, like neon in a tom waits song. it gives me a headache. what will really give me a headache is if i fall over backwards outta my chair and smack my head on the woodstove. i got wood from the shed where it got split by the rental splitter. my friends mike and laura did that for me for a solstice present :-) the pile on my porch is almost used up, so i had to transport wood in the john deere over to the front yard, where i use my trusty axe to split it down smaller for the stove (my cooking splits i call them). it seems like alot of labor intensive steps sometimes. it would be so much easier to live in the shed. i used to haul it back and forth in my wheelbarrow, but that got a flat tire. it was almost nicer that way....quieter. and i'm not so inclined to knock off parts of the porch as i have been known to do with the bucket loader. i went to the post office to ship something to a friend, and a hat i sold yesterday (my first etsy sale YES!). while there, i asked them if i could have one of the extra phone books to use for firestarters. they have been shipping a bag of them a day to the landfill, so they had me back the rondyvan around the side and gave me all of them! they will make a lifetimes worth of firestarters. i am at the library. i am having internet access and monitor problems. i am switching service providers, and will then see what problems still remain. i've been using the cheapest, slowest isp, but now with needing reliable access for ebay and etsy to generate income, not to mention blogging, change is due. i am a hot person. i don't even own a winter coat, i just layer long johns and some fleece zip t's depending on the weather. it's great for winter camping or living in alaska, but it limits me in social situations where people use heat. humans keep their buildings too warm...... 5 minutes in this place and i'm uncomfortable. i have removed as much clothing as i can and still be legal, so i'm not going to stay and try to do any blogging like i intended. i will be back soon, with a blog about border crossings, and how tara came to be my hero. thanks to all of you for your comment love :-) and i will be having some responses to specific questions. p.s. can't do pictures at the library, so how about a song for the day......"man who sold the world" sung by jordis unga. she's got a voice that hurts my heart. sometimes my mind is boggled by the number of untold stories out there in the world. for instance, this morning i was up early and on the road to an appointment north on the interstate. i've got this miserable muscle spasm in my shoulder from an old neck injury sustained when i fell out of a tree. i don't know what i did to aggravate it, except that i'm navigating a little inner turmoil, so that probably accounts for it. anyhow, i'm heading up the interstate, directly towards one of the worst sections of I-81 in pennsylvania for traffic and construction and delays. i don't want to be late, but i don't have enough water with me to heat up and put in my platypus water bottle, so at the last minute, i take the exit to the walmart. i'll grab one of those stick-on heat patches for my neck. leaving the walmart, i see this little sign on the ground, and i am transfixed. i have to waste further time to go get my camera from the rondyvan and take a picture. i mean, what's up with that? even funnier, is when i bend over to take the pic, i realize it's written on one of those individually packaged sanitary napkins. i would love to know what inspired this baby billboard on the pavement, and how we both came to be there just when i needed a good laugh. and cleansed your heart for the last time. i think they never really left. in the end, it was he who came up short. how true. how much of my life i squandered, looking for The Reason for Being. only to find out that the whole point, after all, was just to be here. now. i have this thing, like a quirk. (okay, if you ask my therapist, he'll tell you that i have alot of them). but my big thing is what i see first thing every morning. i believe it sets the mood for the rest of the day. wake up in beauty, walk in beauty. that's one of the main reasons i prefer to sleep outside. the top picture is the view out of the back of the van when it is parked across the road from the house. i sleep there alot, don't waste gas driving anywhere. i don't need to. i am fortunate to be surrounded by open spaces right where i am. the bottom picture was taken one morning from underneath a leanto behind my house. you can see my breath clouding in the cold. i don't blame folks for thinking i'm nuts, sleeping outside at my age. but what a rush, opening my eyes and the first thing i see is that sky. it imprints in your brain, setting up a buffer for the garbage that assaults your spirit the rest of the day. pretty cheap therapy, if you ask me. "So, am I to understand that you broke both your ankles sneaking out your own window so your dog wouldn't know you left? There must be a story there. " i received this email from a fellow dog lover, and was immediately relieved. you see, now that i've started this blog, i am worried about having something to say. in particular, something interesting. worthy. god, i'll settle for something coherent. after all, what's the point if i gave a blog, and nobody came? now, about the pic. this was taken back in september 2005, shortly after being discharged from the hospital after surgery to repair a nasty fracture of my right ankle. i also had a non-surgical fracture of the left foot which was hugely more painful and purple than the right side....nevertheless, they shipped me home with a walker and expected me to navigate. ha! i was non-weight bearing on the surgical side for weeks and for all intents and purposes non-weight bearing on the left without the benefit of anesthesia. (note: you will hear me refer to my injury as "i broke my ankles" since it's so much briefer than "i broke my right ankle and my left foot"). necessity being the mother of invention, you can see me skeining some yarn using my otherwise useless foot. oh, and vandwellers! look in the background to see my luggable loo kitty litter bucket used in conjunction with my bedside commode, thereby elimimating the need for someone to come every day to empty the potty. 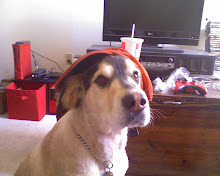 mutt was in a high state of excitement, as he always is when he sees the gear going in the truck, signaling "road trip!" but he had been pretty traumatized by my recent stay in the hospital, and i didn't want him to think i was leaving without him when i drove Cathy back to the garage. god forbid he should experience 5 minutes of anxiety, so i did what any doting 50 year old dogmom would do..... i climbed out my bedroom window, fell, and well, you know the rest of the story. oh, and for the record, i don't do windows anymore. so i have this friend. for real. and he made a comment to the effect of knowing what i look like from the mukluks down. and i got an idea. remember that tv show a couple years back when the neighbor talked to the tool guy over the backyard fence? and half the fun was the thrill of thinking you were gonna finally see his face? i love mukluks. i wear them almost 24/7 from fall til spring. i even sleep in them in really cold weather (camping, not indoors). my muks are by steger in ely, minnesota. 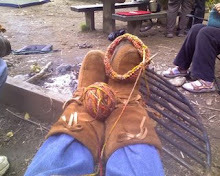 they are moosehide with wool felt liners. my current pair are the "wide" version. i had to get the wides after the broken ankles because it took forever after cast removal for the swelling to go down. it ended up being a good thing though, since they are very roomy now, and i can add extra liners or socks for really cold weather. steger muks cost alot, but they are a bargain for me. i buy a pair, and wear them them for years. when you figure it out, i spend a fraction of what most women spend on footwear, since i only own the muks, a pair of hikers, a couple pairs of mocs, and a pair of knock-off crocs. oh, and my teva water sandals. but except for the mock-crocs, i've owned all the others for years. the best part about muks are that they are flexible and comfortable. they don't restrict your feet, and allow better circulation. they breathe, so you can wear them indoors without ever getting sweaty feet. they do have a straight last, so it's a good idea to switch feet now and then to get even wear on the soles. stay tuned for more about the view from the other side of the mukluks.